INDUCTION: WCW's Mystery Man - Why Anyone Thought This Would Be a Good Idea is the Real Mystery - WrestleCrap - The Very Worst of Pro Wrestling! If there’s one thing in wrestling that seemingly never plays out in any positive way, it would be the infamous MYSTERY man gimmick. Partner, opponent, thing coming out of an egg, whatever, it almost always bombs. In fact, as I prepared to write about the infamous WCW Mystery Man of WCW in 2001, I took a good day or two to think back on any advertised mysteries in wrestling that turned out to be something positive. Look, I’m sure that there have been some good surprises over the years I’ve forgotten, so comment away on all the ones my feeble brain can no longer remember. No matter how many you note, rest assured for every Undertaker unveiling we get 10 Gobbledy Gooker unveil…err, hatchings. And trust me, the one we’re inducting today is on the Gooker end of the scale. To set the table, it’s the end of 2000 and your WCW World Champion is Scott Steiner. Any random YouTube search will tell you Steiner is easy pickings for comedy, but over the years I’ve grown to admire Big Poppa Pump as a performer. I think it’s because he delivers baffling promos while at the same time looking like the most horrifying man alive. That’s a winning combination to me. On top of that, you get the bonus that he appears to be a true mad man. And that is something so sorely missing in wrestling today: a lunatic. Want to know how badly we need that? In recent years, one of the biggest stories in wrestling was CM Punk dropping a ‘pipe bomb’ interview. People were thrilled a guy was saying something they thought he wasn’t supposed to. When Steiner was around, folks were thrilled by a dude possibly doing very bad things he wasn’t supposed to PHYSICALLY. Even when he appears to be completely calm, he scares the living daylights out of me. 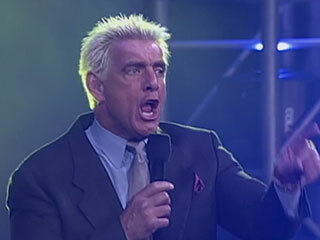 In storyline, Ric Flair, WCW’s CEO, was peeing his pants at the sight of Steiner as well. So much so that he determined that to bring him down, he’d need to stack the odds against Steiner in a three-way match at the WCW Sin pay-per-view against fellow heel Jeff Jarrett and Sid Vicious. After a week or so, Flair decided even that wouldn’t be enough to bring an end to The Big Bad Booty Daddy’s reign of terror, so he made it a four-way with a mystery man, who proceeded to attack Steiner backstage. But not just any mystery man – THIS mystery man!! Yes, a mystery man wearing the most ghetto costume imaginable, just a black outfit covering him head to toe with what at first glance appeared to be stripes of white duct tape. Oh, and he also looked to weigh approximately 500 pounds. Like most pretty much everything WCW at the time, it was anything but impressive. I was going to write, “Why that makes no sense”, but this is late era WCW we’re covering today, so it’s almost more likely for that to be the case. Any guesses as to whom Mystery Man was this night? Here’s a hint: Mystery Man had attacked Steiner the week before. So yeah, of course it’s Steiner this week. 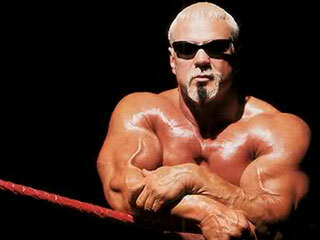 The following week, Flair came out and explained that Steiner was not in fact REALLY his Mystery Man. Sadly, he did not explain how Steiner created the exact same outfit that his non-Steiner Mystery Man was sporting. Too bad, that would have made for great television. Instead, we were told how “The Real Deal Mystery Man” was coming to Sin. No doubt this statement, combined with the fact that Sin was to take place in Indianapolis and the gentleman behind the mask ran like a Weeble led to rampant speculation that the mystery man was in fact RD Reynolds. Spoiler Alert: I was not the WCW Mystery Man. I also decline to state whether talks took place for me to be so. But yeah, all this led to Sin and the big four way match. Except, this being WCW, it starts without Mystery Man as Flair comes out and explains that his boy wasn’t coming out quite yet. Instead, a brutally atrocious brawl breaks out with Sid throwing punches the likes of which you’ve not seen since your six year old brother popped you in your four year old mouth for eating the last of the Captain Crunch. All of this is overshadowed by the complete and total lack of logic in the match as Jarrett tries to help Steiner win, then Steiner tries to help Jarrett win. Again, the title is on the line here so your guess as to why these men would help each other win is as good as mine. Finally, Sid takes control and as he does so, decides for whatever reason to go to the second rope. He leaps into the air to give Steiner a boot to the face (why would that need further air support? ), and in the process lands and snaps his own leg like a twig…and for once, I am glad that the crack WCW production crew missed the shot. They would replay it on Nitro, but I won’t do a gif of it, because it is way, WAY too gruesome. If you want to see it, Google it yourself ya weirdo creepy goon. …attacks Sid, giving Steiner the belt. Why? Who knows. Who cares. And the in the crapper, Mystery Man unmasks as Road Warrior Animal. This is usually where I try to come up with some punchy one-liner to end the show, but honestly, anything I write can’t possibly top that image with “Copyright 2001 WCW” plastered on it. 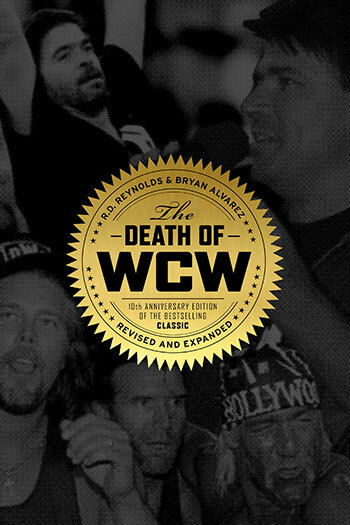 If you’ve enjoyed this induction, you’ll love the new Death of WCW: 10th Anniversary Edition, penned by myself and Figure Four Weekly‘s Bryan Alvarez. Learn all about it by clicking on the cover below! 43 Responses to "INDUCTION: WCW’s Mystery Man – Why Anyone Thought This Would Be a Good Idea is the Real Mystery"
That was absolutely pointless. It has the feel of WCw Creative throwing up their hands and saying, “so got nuthin\'”. That should say “We got nuthin\'”. Stupid autocorrect. For Undertaker, I am sure you meant Survivor Series 1990, unless you put in 2000 for the mystery who took Undertaker’s pants and why he had to use those ridiculous-looking pants that night. Hulk Hogan as the third man. Was that not a mystery partner angle? Yes, that most definitely was a mystery man angle. I think R.D. forgot it because everything that happened as a result was kind of obscure. Odd. I was watching WCW at this time, but I never got the Pay Per Views. I have no memory of the mystery man or anything but the replay Sid’s nasty leg snap. Survivor Series 1990. not 2000. That last screenshot reads like WCW’s tombstone. The Halloween Phantom/ Rick Rude was a pretty good surprise. It wasn’t as good as Taker, but still a good surprise. I remember reading the spoilers online as I was at University that day. I remember letting out an exasperated groan when I got the news that it was Animal. Why would anyone get excited to have a guy come back who was mostly known as a tag team wrestler and had never been in the running for the strap? It all made sense to WCW creative! Same deal with Devon for Aces and 8s! Another mystery man that turned about to be pretty great, was on Raw in 1999 they had this countdown clock and it hit zero when Rock was in the ring. Sure, internet fans new it was going to be Jericho but it isn’t like that was a huge percentage of the audience. Eddie Gilbert brought out a mystery partner in 1989 that ended up being pretty great and that same partner served as a mystery partner of Dustin Rhodes again in 1991. Although to be fair that would have just been a straight match with Rhodes and Barry Windham against the Enforcers. I speak of course of Ricky Steamboat. This pales in comparison to the Undertaker’s 1990 Survivor Series debut for sure but I liked when Owen Hart announced Yokozuna as his mystery partner for their match against the Smoking Gunns at Wrestlemania XI. Yes Yoko wasn’t getting any more nimble in the ring by this time but I liked the pairing as a tag team even if it meant Owen would be carrying them through every match. Considering some of the duds Owen had to team with prior (Koko B. Ware, Jim Neidhart), the pairing with Yoko at least legitimized what seemed like a formidable tag team. Plus it would lead to Owen’s first two WWF championship reigns. They kind of reminded me of the Colossal Connection which I also thought was an awesome tag team back in the day. Andre despite his declining health played to his strengths. Haku will never be confused with Owen Hart but if you have no respect for King Haku, then you have no soul. Because he’ll find out and rip the soul right out of you. I remember the rumor at the time was that the mystery man would be a returning Rick Steiner. Then we got Animal on the PPV and Rick made his return the next night. I always wondered if they intended the mystery guy to be Rick then changed it to surprise fans. No proof, just a thought as to why they would think it would be a good idea. As far as past mystery partners go, who can forget No Way Out 98? The WWF Champion Shawn Michaels is replaced in the main event by Savio Vega. It was actually a fun match, but still, Savio for HBK? 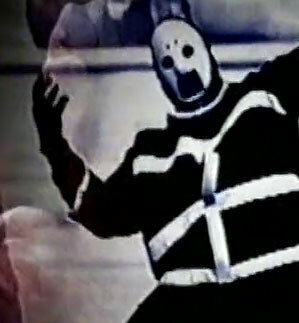 Totally forgot about Animal’s run in WCW toward the end.. Great introduction as always. 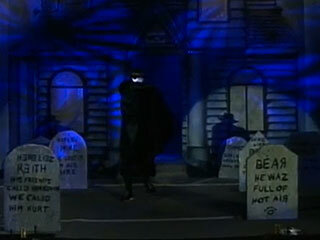 In hindsight though, if WCW was going to do an mystery man angle around this time, who else could have they gotten? Not trying to play fantasy booker here, but outside of an ECW guy like RVD or Taz, I can’t help but feel WCW booked themselves in a corner. I wish this angle would have ended with Steiner taking the mask off. It would have made no sense, but at least it would have been funny. I wish this angle ended with Animal taking the mask off and then reaching into his pocket and pulling out keys to a Hummer. Could’ve solved two mysteries at once. Which Hummer though? At that point, WCW would have a green Hummer set up backstage as a get away for Animal and try to sell that as the Hummer in question. I find it funny that the only mystery man angle that worked ended up giving us one of the most popular wrestlers of the last 24 years. So what did that all lead to?? I dont even remember this and i’m a ginormous Road Warriors fan. It lead to the company going out of business. Nothing against Road Warrior Animal, but this felt like #August1Warning. Low expectations that were too high. Animal didn’t feel like the guy that should go after The Belt. Aww, I was hoping it was that angle i heard about where Rick Steiner got attacked by some guy in a ‘bumblebee costume’ and revealed that it was Rick all along…or WAS this that angle and I had Scott mixed up for Rick. I was looking through old Nitro and Thunder results and it appears it’s actually Scott who’s inside the ‘bumblebee’ costume referred to in the ‘Death of WCW’ book. So the ‘bumblebee’ and the ‘mystery man’ are the same costume. Hopefully that clears up all the confusion. Road Warrior Animal was picked for this angle because his brother took over booking duties during WCW’s dying days. Simple nepotism. This angle led to Ric Flair revealing he was behind the plot to get the belt off of Sid. He had been backing Steiner all along. He turned heel and formed a stable called the Magnificent Seven. The most confusing element to the story-line for me was the fact that there were alternately six or eight members. I actually found WCW enjoyable for those last three months in 2001. I thought they were getting better, after I had to stop watching during 2000. You’re not the only one. For the longest time, I thought I was the only person to realize this about the last 3 months of WCW. Then Bryan Alvarez mentioned that point on a Bryan and Vinny show right after the thing with TNA and Spike went down earlier this year. yeah it was totally getting better, actually think sin was a good ppv besides the main event. so was superbrawl, not so much greed with all of the dusty stuff but yeah was good. Think they were trying to impress potential buyers, shame they got cancelled and it was all for naught. Starrcade 2000 was also really good, but unfortunately by that time nobody cared enough to buy it and it drew one of the worst buyrates in WCW history. 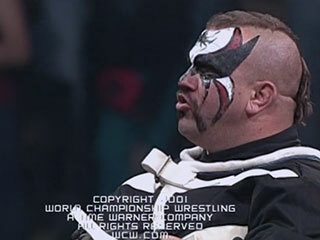 Tazz as Kurt Angle’s mystery opponent at the 2000 Royal Rumble. Mystery Man, big payoff, yay! Depends what you mean by ‘mystery man’. If you mean they’re actually booked based on an eventual surprise introduction then that’s a bit different from someone just showing up with no warning. For instance, Cena’s return at Royal Rumble 2008 was never hyped up as a possibility but Royal Rumbles often have surprise entrants so it blew the roof off before the smarks in the audience remembered they were supposed to be booing him. Same goes for Big Show at RR 2001, one of the most overlooked enormo-pops ever. 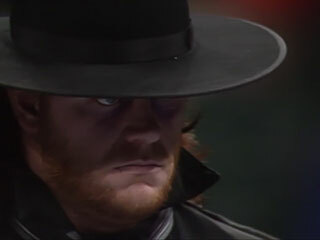 But you could list the Undertaker’s return at Judgment Day 2000 as a booked return even though it was never stated the return would take place on that night, he just rode on down during the overbooked main event and everyone went nuts (at least when they recognised who he was). Same with Jericho in 1999. Also there have been occasions where clues have been given to a return or debut that frankly have been too obvious and given the game away ruining the surprise, yet still got a pretty good reception. I’m thinking Jericho’s WWE return in 2007 when everyone knew deep down it was him (in fact he’d had people chanting for him at No Mercy a month earlier when the main event needed a replacement for Cena, which ended up being Triple H) and to a much lesser extent Christian and Booker T’s debuts in TNA. However, one where TNA absolutely NAILED a surprise debut was with Kurt Angle. There wasn’t even any reports on discussions between them within the IWC, and then out of nowhere after a pretty mediocre Joe/Jarrett PPV main event (which most fans said shouldn’t have closed the show, but obviously this was the reason why) they played a video vignette hyping some guy we didn’t see for ages then suddenly it was revealed to be Angle. They didn’t even have him there in person that night but it was awesome, and ended up being pretty good for the company apart from derailing Joe. I also really liked Lesnar’s introduction to WWE, he literally just ran in the ring with no fanfare and starting kicking the crap out of people. No promos, no nothing, you knew everything you needed to via his actions. You ran out of stuff to write about, now you try to shoehorn decent angles and gimmicks to fit your books and website.